The LACCDR project was developed through a formative process with a diverse group of community stakeholders to inform the project over a multiyear period. The Centers for Disease Control and Prevention (CDC), National Institute of Mental Health (NIMH), and Robert Wood Johnson Foundation (RWJF) are supporting the LACCDR with project partners from the Los Angeles County Department of Public Health (LACDPH), the RAND Corporation, the UCLA Center for Health Services and Society, Loma Linda University, Community Partners, the Emergency Network of Los Angeles (ENLA), and the U.S. Geological Survey. The Los Angeles County Department of Public Health is leading the project and has convened project partners to collaborate in the development, implementation, and evaluation of project components. The Los Angeles County Department of Public Health protects health, prevents disease, and promotes the health and well-being for all persons in Los Angeles County. Our focus is on the population as a whole, and we conduct our activities through a network of public health professionals throughout the community. Public health nurses make home visits to families with communicable diseases; epidemiologists investigate the sources of disease outbreaks; environmental health specialists ensure safe food, water, and housing; and all work with community coalitions to advocate for public policies to protect and improve health. The RAND Corporation is a nonprofit institution that helps improve policy and decisionmaking through research and analysis. RAND focuses on the issues that matter most, such as health, education, national security, international affairs, law and business, the environment, and more. With a research staff consisting of some of the world's preeminent minds, RAND has been expanding the boundaries of human knowledge for more than 60 years. As a nonpartisan organization, RAND is widely respected for operating independent of political and commercial pressures. RAND disseminates its findings and recommendations broadly through the media to help inform public policy debate. The UCLA Center for Health Services and Society strengthens resiliency and mental health in partnership with communities. The Center conducts research to understand how health services are delivered and to improve health services for persons with psychiatric and neurologic disorders across the lifespan. Our focus ranges from access to care to how parity legislation and consumer education affects access, costs, quality and outcomes of services provided. The Loma Linda University School of Public Health Center for Public Health Preparedness (LLU CPHP) exists to cultivate a culture of preparedness and resilience for individuals, communities, and organizations. The primary functions and activities of the CPHP are to provide disaster preparedness planning and training to community partners; and build relationships with governmental organizations, faith-based and community-based organizations, and affiliates in disaster preparedness, response, mitigation, and recovery. LLU CPHP works with diverse partners to promote collaborative approaches, build local capacity for preparedness and response, and provide guidance and support through the integration of academics and research with practical training, education, and programs. Community Partners works with social entrepreneurs, grantmakers and civic leaders to imagine possibilities, design solutions and see them through to results. Building on extensive experience working with nonprofits and funders, Community Partners helps foster, launch and sustain powerful initiatives for change. We are a solutions partner; providing expertise in best practices, a deep knowledge base in project development and management, familiarity with the civic landscape, and a commitment to advancing the public good. Across all program areas, Community Partners works toward our organizational vision: A vibrant society in which individuals and institutions use knowledge, resources, and relationships to build equitable, democratic and thriving communities. Emergency Network Los Angeles, Inc. (ENLA) is a network of Los Angeles County, non-profit, community-based organizations (CBOs) that provide assistance to individuals, families, and organizations following emergencies and disasters. ENLA works in coordination with government agencies and the private sector. ENLA is recognized by the Los Angeles County Operational Area and the City of Los Angeles as the networking agency for community based organizations. ENLA is the Los Angeles County VOAD (Voluntary Organizations Active in Disasters), and is recognized by Southern California VOAD and National VOAD. ENLA is incorporated as a 501(c)(3) organization under the laws of the State of California. A visual artist documents meeting discussions and the story of the LACCDR at a final coalition meeting on June 25, 2015. 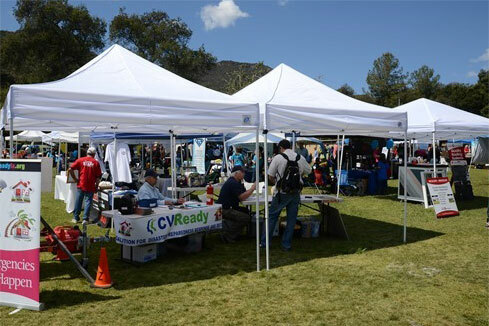 Many coalitions regularly provide preparedness and/or resilience information to the broader community at health fairs and community events. June 2015 Final coalition convening of LACCDR demonstration phase held June 25th, 2015. The LACCDR celebrated the conclusion of the demonstration phase of the project, with a final convening of all sixteen coalitions and partners from LACDPH, UCLA, ENLA, RAND, Community Partners, and Loma Linda University. Participants led discussions about lessons learned regarding resilience, developing partnerships, and sustaining the activities of the coalition. Participants received copies of Resilience Builder, a toolkit for developing community resilience based on the project. While the demonstration phase has ended, many of the coalitions will continue their efforts together. March 2015 LACCDR begins its second round of tabletop exercises with all coalitions. This round will be useful in assessing how preparedness and resilience levels have changed in the past year. February 2015 Chorus mobile health framework is launched. Chorus is a participatory mobile health framework and web application to enable patients, providers, researchers, and community leaders to create their own personalized mobile health interventions. The LACCDR Chorus quiz game is being used at community outreach and training events as a quick and simple way to collect information about participants, and also to gain a better understanding of who is attending the events, what they plan to do related to disaster preparation after the event, and what kind of impact is being made by each coalition's work. After the quiz game, participants receive tips to help them prepare for a disaster. See a summary of the first two months of Chorus usage. 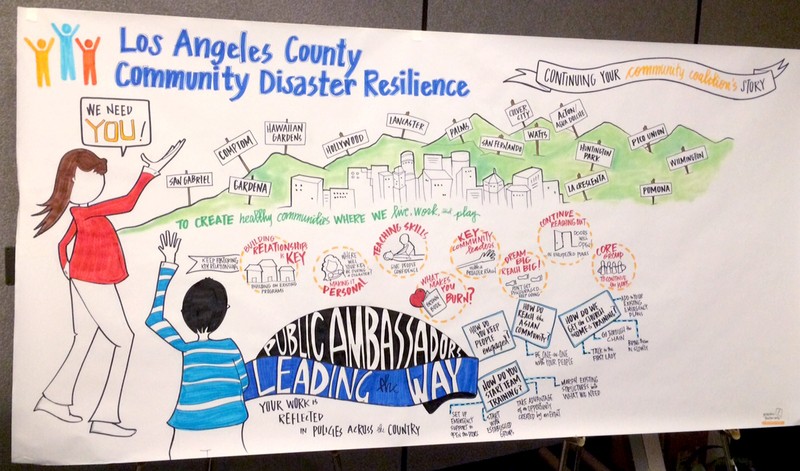 January 2015 LACCDR project partner Community Partners organizes two Year 3 Convenings: one for all Preparedness coalitions and one for all Resilience coalitions. The convenings feature guest speakers and panels focusing on sustainability and storytelling. See pictures of the event.